“War conditions, i.e., the father’s service in the Forces, full-time factory work of many mothers, evacuation as a precautionary measure and the destruction of many small homes through bombing have disrupted family life among large sections of the population. Consequently many infants, though not parent-less, were rendered homeless. 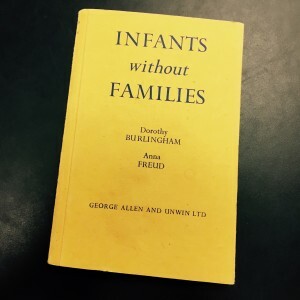 They had to be collected in residential nurseries and there suffered the experience of “life without the family” which is, in peace-time, reserved for the inhabitants of orphanages. Attachment bonds are at the heart of relationship and what let us latch on to the love that leads to our development as human beings. It is the family that is naturally the home of this attachment and this is why the family unit is seen as the building block of civil society. Attachment theory, then, is as much about the potential for humans to flourish as it is about child-rearing.